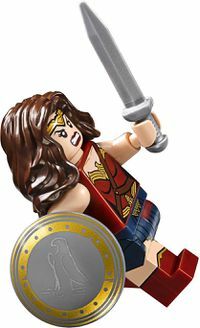 Wonder Woman, or Diana Prince, is a minifigure from the DC Universe Super Heroes theme, initially released in 2012 in 6862 Superman vs. Power Armour Lex. Wonder Woman also appeared in The LEGO Movie as a minor character voiced by Cobie Smulders (How I Met Your Mother, Marvel's The Avengers), and as a result of that appears in The LEGO Movie Promotional Set. When together with Superman and Batman, she is considered a part of the trinity, representing a common ground between Superman and Batman's philosophies. She also tends to have more fantastical adventures in comparison with Superman's science fiction endeavors and Batman's dark detective stories. Wonder Woman has five variants, all of which have bare arms leaving them fair. Wonder Woman's first version is based off her classic appearance in the comics. She has long wavy black hair, with her signature golden tiara with a red star in the middle. She has fair skin, black eyebrows, black eyelashes, and black eyes with white pupils. Her mouth is decorated with dark red lipstick, her head is double sided - one side is smiling and the other is angry. Her torso is mainly red, with a golden W at the the top. She has printing on her legs which shows blue, starred tights and red boots with white accents. She comes with her golden lasso of truth as her accessory. Wonder Woman's New 52 variant, released in 2015, features the same hairpiece as before, except the tiara will be silver, instead of gold. Wonder Woman's torso is printed with her red costume, including a double-lined piece of silver armour with an eagle's head border the top, while a single piece of silver armour pointed downwards lines the bottom. Her hips and legs are dark blue, with the hip continuing the silver armour piece printing at the bottom of her torso. The legs are printed to depict her boots. As with her previous version, Wonder Woman's arms, hands, and head are flesh-toned, and the head features double-sided printing. Later in 2015 she debuted as a DUPLO Figure. Wonder Woman has long black hair. She has fair skin and at the top of her head she has a printed golden tiara with the red star symbol in the centre. Wonder Woman has curved black eyebrows over her blue eyes. She has a smiling open mouth showing her white teeth, and her lips are covered in red lipstick. Unlike her other variations, she has a rounded nose in the centre and two rounded ears at the left and right side of her head. Her torso is similar to her first variation: mainly red, with a golden W at the the top and a golden belt with the red star in the centre. She has printing on her legs which shows blue starred tights and red boots. In 2016 Wonder Woman got a figure based off her appearance in Batman v Superman: Dawn of Justice. Wonder Woman has longer dark brown hair, with more volume. Her golden tiara is now printed on her face, it now points downwards and has various black lines going through it. One side of her head has her eyebrows in a regular position with her mouth smirking. The other shows her gnashing her teeth and her eyebrows are slanted. Wonder Woman's lipstick and torso are both dark red. She has a long brown strap going down from the top right of her torso and splitting into two pieces in the middle. Wonder Woman's golden symbol now in two places at the top and the bottom of her torso. At the top of her torso it separates her amour from her bare skin. At the bottom of the torso it begins, only to be continued onto her legpiece. The top part of her legs are dark blue, with various black lines representing her skirt. The bottom of her legs are dark red with golden accents at the top representing her boots and there's bare skin in between the skirt and the boots. Wonder Woman's arms are given silver bracelets here, with black outlining. In 2017 Wonder Woman will get a Mighty Micro variant. The Mighty Micro version features the same hairpiece as her first version. Her face has large white sclera around her eyes. She has a large grin on her face with her teeth gnashing. Her lipstick and her torso are both red. There is a large golden Wonder Woman logo at the top of her torso and the bottom of her torso has a golden belt pointing up. Wonder Woman has short azure legs. Wonder Woman features in her costume from The New 52 for LEGO Batman 3: Beyond Gotham. It features a silver tiara and red shirt with lines and stars engraved. A double-lined piece of silver armour with two w's and an eagle's head border the top, while a single piece of silver armour pointed downwards lines the bottom. She wears dark blue trunks with only two stars at the waist. Her boots are also blue with white trim and a bit that drifts downward and she wears a pair of bracelets. A version of Wonder Woman disguised as Cheetah is also playable. In-game, Wonder Woman is able to fly (which causes the Wonder Woman theme song to play in LEGO Batman 3), throw her tiara, use her lasso to pull grapple handles, and deflect bullets or lasers with her bracelets. She is no longer invincible, but her hearts do regenerate if she is given enough time without taking damage. Diana is an Amazon from the island of Themyscira and her mother, Hippolyta, is their queen. Hippolyta was told to take some clay from the shore of Paradise Island and mould a baby girl. Six members of the Greek Pantheon then bonded a soul to the clay, giving it life. Each of the six also granted Diana a gift: Aphrodite, beauty and a loving heart; Artemis, a hunter's spirit and communion with animals; Athena, wisdom and courage; Demeter, great strength; Hermes, speed and the power of flight; Hestia, sisterhood with fire. Diana grew up on Themyscira, curious about the rest of the world. When she was a young woman, a man named Steve Trevor crash landed on the island with news of war. The gods decreed that the Amazons must send an emissary into Man's World. The mission was one of peace, but part of it involved defeating a mad plot by Ares to destroy the world. Queen Hippolyta ordered a contest to be held, but would not allow Diana to participate. Diana disobeyed and wore a disguise. She easily won the contest with the gifts of the gods and was named the Amazons' champion. Diana was given several items to take with her: An invisible jet, the Lasso of Truth, bulletproof bracelets, and a uniform fashioned to show respect to the foreign culture. Diana went to Boston and created a secret identity, Diana Prince. In Boston she befriended Dr. Julia Kapatelis, and her daughter, Vanessa Kapatelis, as well as the Air Force Officers Steve Trevor and Etta Candy. Diana stayed with Julia and Vanessa, who taught her to speak English. After a battle with Decay in the streets of Boston she first came to the public's eye and was given the name Wonder Woman. She managed to foil Ares's plan, and became a super heroine. At first, Wonder Woman only fought villains connected to Greek mythology and their henchmen, such as Ares, the god of war, and Circe, a greedy goddess who fears that Diana is the answer to a prophecy which will mean the end of her immortality. This changed when she encountered a female Nazi spy, Baroness Paula von Gunther. Baroness is a crafty individual with an array of gadgets and gizmos that enabled her to escape Wonder Woman's clutches. Other enemies of Wonder Woman include Dr. Psycho, a misogynistic little man who is against everything Wonder Woman stands for, Doctor Cyber, who is intelligent, but insane because of a deformed face, Giganta, a woman who can grow to monstrous sizes, Silver Swan, a homely young dancer who had wanted the lead in her troupe's Swan Lake but was passed over because of her acne-ridden face in favor for a woman more conventionally beautiful, and her arch-enemy, Cheetah, the accursed form of Diana's former friend Barbara Minerva who has been transformed by a cat god named Urzkartaga. While Wonder Woman's rogues gallery grew, her allies did too, including her best friend, Etta Candy and her love interest, Steve Trevor (who may be considered an analogue to Lois Lane). I-Ching trained Wonder Woman in martial arts when she gave up her abilities to stay in Man's World. Kanga is Wonder Woman's pet kangaroo who is also a founding member of the Legion of Super Pets. Wonder Woman occasionally rides Kanga into battle. Donna Troy, Diana's sister, also fights along her side when needed, originally as Wonder Girl, and then as Troia when she aged to adulthood. Cassie Sandsmark, a girl who was inspired by Diana and Donna, more recently took up the mantle of Wonder Girl. When not working with Wonder Woman, Wonder Girl is also a member of the Teen Titans and even rose to become their leader when Robin stepped down. Wonder Woman has also mentored Supergirl and was a founding member of the Justice League, making them some of her most valuable allies. Also among the Justice League's ranks are core members Superman, Batman, Green Lantern, The Flash, Cyborg, Aquaman, and Martian Manhunter, who are sometimes joined by Black Canary, Green Arrow, Zatanna, Hawkman, Hawkgirl, Atom, and Shazam!, as well as a pantheon of other heroes. After The Flash and Reverse-Flash reboot the timeline, Diana's history is greatly affected. Though she believes herself to have been moulded from clay, she learns that she was conceived in an affair between Hippolyta and Zeus and that the clay origin was part of an elaborate coverup to protect her from Zeus's wife, Hera. When, Zeus goes missing from Olympus, Hera begins to learn about some of his more recent affairs with mortal women and seeks retribution. When Wonder Woman intervenes by protecting a woman named Zola who is pregnant with Zeus's child, Wonder Woman and Hera learn the truth about Diana's parentage. Hera has Hippolyta turned to stone and the Amazons transfigured into snakes. In distress, Wonder Woman leaves the island to protect Zola's baby and her other half-siblings while trying to keep peace among the gods while Zeus is missing and ultimately rescue her sisters. Wonder Woman is still a founding member of the Justice League and becomes romantically linked to Superman. Diana was born around five thousand years ago on the island of Themyscira to Queen Hippolyta of the Amazons, and was brought to life by Zeus, a Greek god. Around the time of World War One a man named Steve Trevor crash landed on her island. Diana took Steve back to Britain and fought with him in the war. Many years later Diana gave up crime fighting after deeming humanity wasn't worth saving. She became an antiquities dealer and took up the second name Prince. Diana learned that Lex Luthor had a picture of her from 1918 and was determined to keep it from being released to the public. While attending a one of Lex's parties, she witnessed Bruce Wayne planting a hacking device into Luthor's system. She stole the device when Bruce wasn't looking. At another event she placed the device into Bruce's car and admitted she stole from him after confronting her. Sometime later, Diana received an email from Bruce, which contained the picture of her. Diana decided to move location in order to stay secret and and was about to board a plane when she saw a fight between Doomsday and Batman and Superman on Stryker's Island, from the news. Diana decided to join the fight and helped defeat Doomsday, but lost Superman in the battle. At Superman's funeral Diana and Bruce decided to assemble a team of super heroes in order to defeat super powered villains. Wonder Woman is a member of the Justice League. When The Joker and Lex Luthor team up, she is among the heroes who arrive in Gotham City and she helps the weakened Superman to support the crumbling Wayne Tower while Batman, Robin, Green Lantern, Cyborg, and The Flash defeat the villains' robot and then stabilize the tower. She participates in the final battle. Some time later, Wonder Woman and Superman are forced to cut their date short when the Legion of Doom attacks the Watchtower. Teaming up with Flash, he and Diana are able to defeat Cheetah and Firefly while the other Leaguers round up the other villains. However, their victory is cut short when Brainiac reveals that he has taken control of Green Lantern's mind and by combining his energy with that of the six other lantern corps plans to shrink the Earth, which he begins to do so. The Legion of Doom offers to assist the League, and Wonder Woman and Flash find themselves working directly with Cheetah as they fend off an invasion of the Watchtower and prepare to board Brainiac's mother ship. When they reach Brainiac, Wonder Woman slings her lasso around his hand, but finds that it has no power over him. He exerts his mind control over her and the others (except for Robin, who is protected by the Helmet of Fate), but she, Batman, and Solomon Grundy are able to break it and then defeat Brainiac, though he escapes. Superman damages the shrinking ray, causing the Lanterns' powers to go haywire, and Wonder Woman is hit by a blast of Red Lantern energy which causes her to feel unnaturally angry. A weakened Superman falls towards Earth, and Wonder Woman and Batman fly after him. They touch down in France, but find that it has been shrunken, and the three of them chase Brainiac through mini European cities. They attempt to stop him, but he is able to capture Paris, London, and Pisa. Brainiac heads towards Gotham City, where his mother ship crash landed. The other Leaguers and Legionnaires defend the city against him and Wonder Woman, Batman, and The Flash are able to disable the mother ship and prevent Brainiac from shrinking Gotham further while subduing his mother ship. With Brainiac neutralized, the League embark on the next step: To collect the different Lanterns and restore the Earth. Disguised as Cheetah, Wonder Woman joins Batman, Robin, and Solomon Grundy in collecting power batteries from the more hostile Red, Orange, and Yellow Lantern corps. Though they successfully trick Atrocitus and Larfleeze with their villainous disguises and Green Lantern as a prisoner, Sinestro sees through their trap and battles with them and they are able to escape successfully (though they accidentally leave the Invisible Jet on Qward). The League heads to the Fortress of Solitude where Superman has forged a replica of Brainiac's crystal, but before they can focus the Lantern energies through it and restore Earth, Atrocitus, Larfleeze, and Sinestro arrive to retrieve their stolen power batteries. The League, Legion, and Lanterns are scattered amongst the snow and ice in the fight, but Wonder Woman is able to collect herself, and, along with Batman and Robin, see that the Lanterns focus their light through the crystal all at once while they fight. Earth returns to its normal size and the Lanterns are forcefully returned to their home worlds, but Superman, who absorbed some of the crystal's energy, grows to a gigantic size and Brainiac takes control of him. Wonder Woman, Robin, and The Flash fend him off until Batman is able to break the spell and Brainiac is defeated. The cities he had stolen are put back in the right places and he is incarcerated. Wonder Woman also helps to round up the Legion of Doom, which fled when the shrinkage was undone. Wonder Woman was one of the Master Builders who had successfully evaded Lord Business after he acquired the Kragle and took control of the LEGO universe. Wonder Woman and the rest of the escapees were assembled at Cloud Cuckoo Land once Emmet, the prophesied "special," found the Piece of Resistance. After Emmet displayed his confusion and ineptness to lead them to victory against Lord Business, many of the Master Builders left angry and disappointing, including Wonder Woman, but were too late as a tracking device placed on Emmet's leg by Bad Cop led the Robo SWAT straight to Cloud Cuckoo. She fought along side several Master Builders, but she was defeated and taken to the think-tank where Business used the creativity from captured Master Builders to create instruction manuals. After Emmet sacrifices himself to stop the destruction of the office tower, and the inspirational message to the ordinary citizens under attack, Wonder Woman some how ends up in Bricksburg. She battles alongside the citizens and fellow Master Builders. After Lord Business is persuaded to destroy the Kragle, Wonder Woman regroups with the rest of the protagonists to join in the celebration. In preliminary images of LEGO Batman 2, Wonder Woman's legs are flesh in the back and insides, rather than red. This is corrected in the final game. When Wonder Woman has her tiara posed to throw or in the air in LEGO Batman 2, it is never removed from her head. Also, when using her lasso to pull grapple handles, it has the appearance of a chain, rather than the piece used for it. These mistakes were fixed in LEGO Batman 3. When she flies in LEGO Batman 3 it plays the 70's Wonder Woman theme song. Talia Al Ghul, Satele Shan, and Faora reuse her head. The Cowgirl also reuses her lasso mould, but in a different colour. Wonder Woman, Poison Ivy, and Harley Quinn were voiced by Laura Bailey in LEGO Batman 2 and LEGO Batman: The Movie. Bailey also voiced Black Widow in LEGO Marvel Super Heroes and the "Maximum Overload" shorts. The LEGO Movie is Wonder Woman's first full theatrical appearance. Her legs and hairpiece are made in China. This is a description taken from LEGO.com. Please do not modify it. Watch the skies where LEGO Wonder Woman is protecting the planet with her amazing super-powered abilities! Born on Paradise Island, Wonder Woman keeps criminals in check with her super strength, sublight speed and a magic lasso of truth that makes criminals confess! When she teams up with Superman, they become a powerful pair that no villain wants to cross! This is a description taken from LEGO.com. Please do not modify it. Wonder Woman The powerful and beautiful princess Diana is a legendary Amazon from the island of Themyscira. She has an invisible plane for light speed and outer space travel, and her endurance, strength, and power is on par with the Greek Gods. With her Golden Lasso of Truth and unbreakable bulletproof bracelets, she is a valuable asset to the Justice League. ↑ "A worrying trend: 'hybrid' minifigs in regular sets" - Brickset.com.